Monster Jam Tickets are very popular with people that love the see monster trucks juming cars and racing. This is a family friendly show. When you see this show you will have the chance to see different trucks like Grave Digger, Mohawk, Son-uva Digger and many more. Get your tickets today! 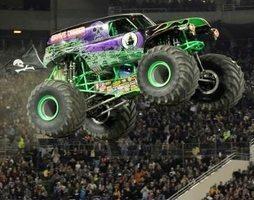 Monster Jam tickets are easy to get when you buy them from GoodyTickets. With you in mind, we have made it very easy to find the best seats and the best date or dates that work the best for you. Sit back and enjoy the show from GoodyTickets to see this exciting event.